For the first time in 16 years, Apple sent a letter to investors at the end of trading hours Wednesday, warning them that the company was drastically lowering how much money it expected to make for the financial quarter ending December 29. Apple originally estimated revenues of around between $89 billion to $93 billion; CEO Tim Cook’s letter said the company now expected revenues of $84 billion. In 2017, Apple brought in $88 billion — meaning Cook’s letter was warning that Apple, for the first time in his tenure, would be bringing in less revenue during the vital holiday season than it had the year before. Apple watchers shouldn’t have been shocked — companies in Apple’s supply chain had been reporting their own weak forecasts since mid-November, making everyone very nervous. But Cook’s letter raised eyebrows both for how drastically the company is lowering its expectations, and for its explanation for why the company is missing its sales estimates, with Cook blaming Apple’s woes on everything from a strong dollar to a different release schedule for iPhones compared to last year (in 2017, it didn’t release the iPhone X until late November, meaning its financial quarter was always going to look different in 2018 than it had in 2017). The extent of Apple’s poor performance in China, which has been spurred by consumers’ spending less and saving more in the face of economic uncertainty, may have taken Cupertino by surprise. But the underlying causes of Apple’s sales woes aren’t going away — and they’re bigger than just China. While many are quick to attribute Apple’s problems in China to the country’s trade tensions with the U.S., the reality is that the iPhone’s problems in China predate Trump’s trade war. We’re entering the age of smartphone decline, and Apple’s bad news will likely be followed up by more dour reports across the board from most established smartphone manufacturers. The biggest problem that Apple faces in China is also its biggest strength in North American and European markets: iOS. In the United States, if you want stay within the Apple ecosystem and avoid the dreaded green texting bubble (and potentially get dropped from group chats), you have one manufacturer to buy from: Apple. Accordingly, the iPhone accounts for 40 percent of the smartphone market, with consumers happy to pay a premium on Apple phones in order to use iOS. But in China, most smartphone usage revolves around an app called WeChat, which is essentially an operating system masquerading as an app, allowing users to do everything from chatting with other people to ordering a taxi or paying their electrical bill. And WeChat runs equally well on both Android and iOS phones, meaning that the appeal of iOS is drastically reduced in China. The magic of Apple products, and of the iPhone in particular, has been the company’s careful melding of its hardware and its software, but that magic simply doesn’t matter as much in China. There the iPhone has to compete, more or less, purely as a piece of hardware — and Chinese and other smartphone manufacturers are arguably making phones with hardware as good as Apple’s. The fact that the Android software seen in Huawei or Samsung smartphones lacks in sophistication compared to iOS doesn’t mean much if all you’re doing is opening your phone to get to one app. This doesn’t mean Apple can’t compete in the Chinese market. The iPhone X was the most popular phone sold in China in 2018. But this success is based on a bit of an apples-to-oranges comparison (no pun intended). Apple only releases a few phones every year, while nearly every other manufacturer releases a much broader range of devices at various price points. At the same time that the iPhone X was selling so well, Chinese cell manufacturer Huawei surpassed Apple to become the world’s second largest manufacturer of smartphones, behind only Samsung. But two things may have made the end of 2018 so difficult for Apple. 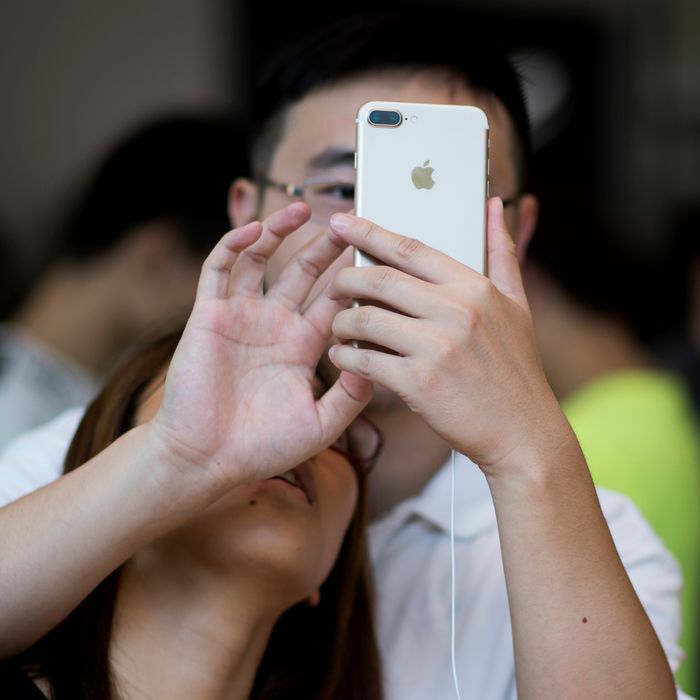 Apple has always struggled in China during its “S-years” — the years in Apple’s two-year iPhone refresh cycle during which it does very little to alter the look and form factor of its phone, and instead focuses on smaller software and hardware upgrades. Again, because Chinese consumers are buying Apple products mainly for the hardware, neato tricks with iOS or better photo post-processing simply don’t hold as much appeal. So this year’s line up of the iPhone XS, iPhone XS Max, and iPhone XR may have held little appeal for the average Chinese consumer. More to the point, in a consumer downturn, it’s perhaps not surprising that Chinese customers weren’t lining up to buy a set of phones that, on the hardware level, were largely indistinguishable from what Apple was offering one year before. More worrying for Apple (and all smartphone manufacturers) is that consumer confidence has been falling across the globe since mid-June. Smartphones are a vital part of modern life — but barring a completely shattered screen or a similar disaster, they’re also a purchase consumers are increasingly finding easy to wait for. “While Greater China and other emerging markets accounted for the vast majority of the year-over-year iPhone revenue decline, in some developed markets, iPhone upgrades also were not as strong as we thought they would be,” Cook wrote in his letter. Upgrade cycles — the periods between which customers purchase new phones — have been elongating across the globe, particularly in the U.S. “Over the last five years the replacement cycles of smartphones in the U.S, have increased from an average of 20.6 to 24.1 months,” says Jennifer Chan, global insight director at Kantar Worldpanel. “But iOS customers have the longest replacement cycle, at 25.9 months.” Because iPhone customers tend to be so dedicated to Apple, every extra month that an iPhone user holds on to their phone is another month in which Apple isn’t selling a new phone. Apple has been preparing for this future for a while with a twofold strategy: raising the average price of its phones and increasing the amount of revenue it brings in through services (think everything from Apple Music subscriptions to iCloud storage to the 30 percent of revenue Apple takes from every App Store purchase). Apple has raised the average selling price of its phones quite successfully — the average price of an iPhone is now an eye-watering $800, while the rest of the market hovers around $300. This means that even while Apple has sold fewer phones overall over the past few years, its profits have risen. But it’s a strategy that was always eventually going to hit a ceiling — higher prices have also induced people to hold on to their iPhones for longer. Apple’s offering of iPhones this year seemingly wasn’t sufficiently enticing to get enough people to upgrade their handsets, whether that’s because 2017’s iPhone X and 2018’s iPhone XS are nearly indistinguishable, or because Apple’s budget play, the iPhone XR (still pricey at $750), has seemingly struggled to find a market. Meanwhile, increasing revenue through its services is a long-term play; Cook’s stated goal has been $20 billion in annual services revenue by 2020. And it’s a goal that requires a broad install base across the globe. Quite simply, there is no other market besides China for Apple to expand into — Apple has hit market saturation everywhere else where consumers can realistically afford an iPhone. Apple’s services strategy has seemingly been working so far, with the company on track to bring in $10 billion in services revenue in 2018. But Cook’s letter is warning that Apple may miss its revenue target by somewhere between $5 and $9 billion dollars. Services revenue simply isn’t mature or developed enough to support Apple if iPhone sales are falling off this rapidly. Some of Apple’s problems are uniquely its own: using its monopoly on iOS as a way to charge a premium on its handsets, positioning itself as a luxury brand in a time of economic anxiety, and attempting to sell fewer phones for more money at the precise time that many people are seemingly catching on to the fact that they don’t need to buy new phones nearly as often as they had thought. But make no mistake — the smartphone market has hit saturation in nearly every market across the board. A few companies have done extremely well selling smartphones over the past decade, and none more so than Apple. In 2017, while Apple only sold 19 percent of the smartphones purchased globally, it also captured 87 percent of the profits, according to Canaccord Genuity. But the next decade will be drastically different. Double-digit growth in smartphone sales is likely a thing of the past, except in a few markets like Africa and Latin America, where handset prices (and manufacturer margins) are low. The only new smartphone tech on the horizon, drastically faster 5G data connections, seems unlikely to spur a new upgrade cycle — do you really find yourself frustrated with your LTE data speed all that often? There are early signs that Samsung’s fourth-quarter earnings, due to be released at the end of January, may also be disappointing. Phone makers like LG and HTC are already slowly exiting the smartphone market. Chinese smartphone manufacturers like Huawei and Oppo are doing better, but mainly by selling a broad swath of phones across many different markets. The simmering trade war between China and the U.S. doesn’t look like it will be abating anytime soon. Apple will be fine — there’s no chance a “For Sale” sign will be hanging off its space donut Apple Park headquarters in the near future. While analysts are predicting that Apple’s pain in China will continue throughout 2019, with one Goldman Sachs analyst comparing Apple to Nokia (not a company you want to be compared to), for the foreseeable future, Apple will still sell billions of phones, and bring in billions in profit. But the new reality is clear: while Apple has evidently known that it would need to find a way to survive in a world in which it would sell fewer smartphones, it may not have made its changes fast enough, and the company and its investors need to prepare for a decade of figuring out what comes after the iPhone.